Joy teamed with Mother Nature to bring you this bleach- and chemical-free cleaner and disinfectant that kills 99.9% of household germs. Designed to use on virtually every surface, try it on glass, stainless steel, granite, in the bathroom, shower, kitchen and much more. 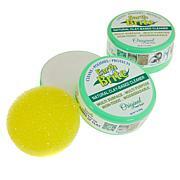 It eliminates odors and leaves a subtle scent once the Thymol scent dissipates. Isn't it time for a more complete clean? 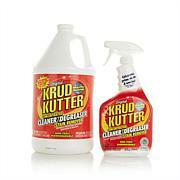 CDC (Centers for Disease Control and Prevention) recommends that you routinely clean and disinfect surfaces with an EPA registered disinfectant as part of the "Seven Keys to a Safer, Healthier Home." Over the past week, some customers have expressed concerns about the MiracleClean product. There were a few common themes across the feedback we received, and we wanted to be sure to address them and hopefully set your minds at ease. 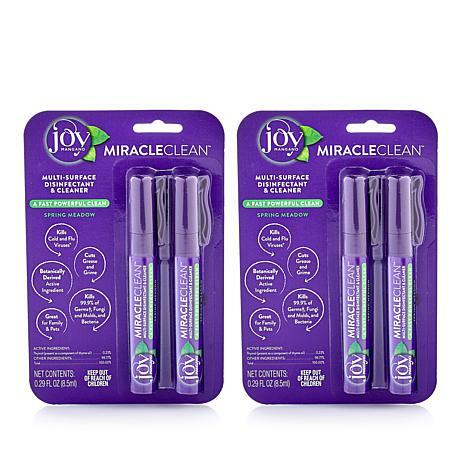 We temporarily removed MiracleClean from HSN.com while we reviewed all comments. What’s up with the smell? MiracleClean’s primary scent is Thymol, the botanically derived active ingredient and a component of Thyme Oil, which comes from the Thyme Plant. Thymol is found in products many of use daily as a powerful antiseptic/disinfectant. MiracleClean is infused with Forever Fragrant technology, so you’re left with the subtle scent of Orange Blossom, Warm Vanilla, Fresh Linen or Spring Meadow after the scent of Thymol dissipates. We know this new smell of clean may take some getting used to, but we do hope you’ll give it another try. If the scent is too strong, start with less product than you would normally use. You can rinse it if it’s still too strong, though you don’t have to. Although the scent may take some time to get used to, we’re sure you’ll love MiracleClean’s cleaning power right away! Keep these in my purse so I can use when I am out and about town. I've read all the reviews of this product & do not understand the drama & warnings silliness. I'd like to counter the 'warnings' - have a look at the very first ingredient in your mouthwash....yep - it's thymol. And you put that in your mouth! 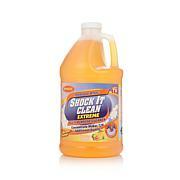 This is the very best cleaning/sanitizing product that I've ever used. Smell disappears. I am hopeful that HSN continues to produce this product! I no longer carry hand sanitizer! I'm going to buy more..I have the full size on autoship. It desolves. EVERY stain no matter how set in. Excellent product! Bought these and the larger Miracle Clean on auto ship. This stuff cleans everything better than anything else! I use for cleaning and even spraying mattresses when washing the sheets. Its amazing! After a few minutes the smell dissipates to a wonderful fragrance! One is always in my bag; they are refillable!! The herb smell does not linger at all. There's always vinegar - that doesn't smell great and it lingers!